In 1860 both Paul Comolera and his student Jules Moigniez created models of two sparrows locked in "combat" for the salon. 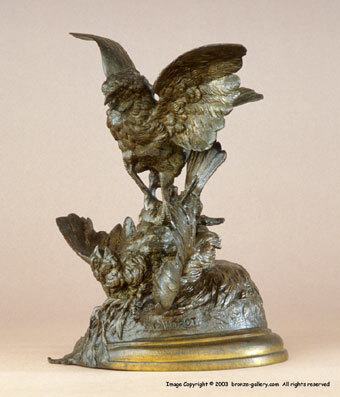 Ferdinand Pautrot decided to also submit a model of two sparrows in combat to compete with these other sculptors by submitting a model of the same subject. The contrast between these three examples of the same subject are striking. Each artist has taken the identical subject and rendered it in a similar manner but each artist has kept their own unique style. By far the rarest of these three examples is the one by Ferdinand Pautrot. 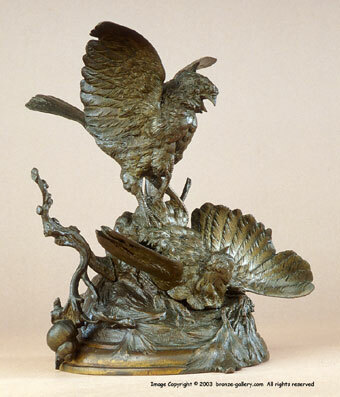 In our 30 years of involvement in bronze sculptures we have only seen one example of this subject by Pautrot.